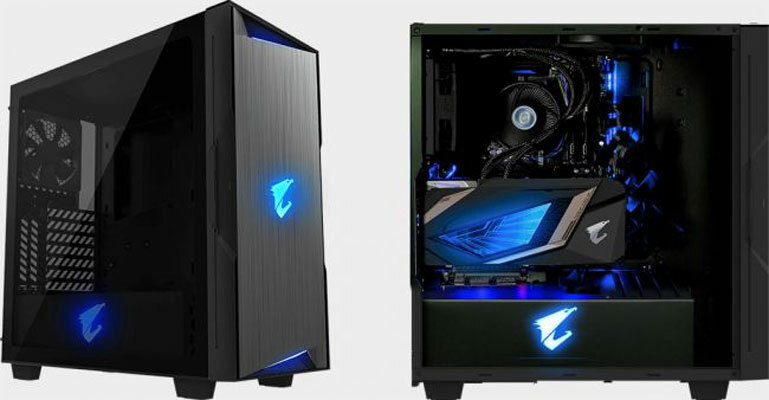 If you think of your graphics card as a center piece of your gaming PC as much as a component in your gaming system, then Gigabyte's new Aorus AC300 Glass case may be a worthy next upgrade for you. It comes complete with the typical bells and whistles of a gaming chassis, including a fancy brushed aluminum exterior, a glass side-panel and RGB lighting, but it also bundles in a vertical graphics card mount so that you can show off your GPU in all its glory. Graphics cards are, like many other PC components, often styled with fancy coolers, RGB lighting, colorful and branded shrouds and a host of other aesthetic effects. But so often you can't see them once the card is installed. Even if you have a case with a window all you can really see is the "top" of the card once it's installed, unless you're running a horizontal gaming PC, but that's not exactly conducive to viewing everything all the time. Vertical graphics cards mounts have started to change that in recent years, coming in the form of hard plastic angled mounts and PCIExpress extender cables. Gigabyte's Aorus AC3000 bundles is a combination of both and lets you show off what your GPU looks like whilst maintaining the full complement of its performance. It comes with a riser cable to help you re-orientate the graphics card and an altered mounting system so that even in its new placement, you still benefit from the structural stability of the case's rear-panel mounting system. Other features include tempered glass for the side panel that is both scratch and rub resistant, LED controls and three USB ports in the front I/O panel and space for up to three 2.5-inch drives and two 3.5-inch drives. The case isn't available just yet, but when it does go on sale it's expected to mirror its predecessor with a cost around the $130 mark.